Remodeling your kitchen can be one of the best ways to improve the value of your Arizona home. If you live in a hot real estate market like Phoenix, investing in kitchen remodeling can help your home stand out so that you sell your house faster and get more for it. Even if you don’t plan to sell anytime soon, remodeling your kitchen can make it a nicer space for you and your family. Before you start changing anything, you need to carefully evaluate the current layout and style of your home. For example, if you live a mid-century modern home, it wouldn’t make much sense to tear out the original appliances and replace them with modern designs. And actually, many of those older appliances are worth keeping as they now have quite a high value. Your kitchen renovation should respect the overall style of the home, unless you plan on redoing every room. It should also work with the current layout or should improve it. For example, you might consider taking down a wall separating the kitchen and the living room so that you can talk to guests while you are cooking or preparing meals at the counter. Or you could have just half the wall taken down to create visibility. An open floor plan is preferred by many buyers, and it will make your house look larger. Kitchen remodeling doesn’t have to mean changing everything about the kitchen. For example, say you have some quality cabinets made out of good wood and not particle board. You don’t need to replace those. In fact, you probably shouldn’t replace those. If you want a new look for your cabinets, you might consider getting new doors and drawer fronts, as well as new knobs, handles, and hinges. If you want a whole new look, you can even have them re-painted or re-finished. Add a nice granite counter top to your cabinets and you’ll have a whole new look for your kitchen. You don’t always need to makeover everything in the space. You might already have lovely floors. Or you might just need a new backsplash and sink to liven up the cabinets you already have. Talk with your Phoenix residential general contractor about the improvements that will make the biggest impact on your enjoyment of the space and the potential resale value of the home. You don’t really need high-end appliances for your Phoenix kitchen remodel. They don’t tend to get back what you put into them. And maybe you want granite countertops, but you really can’t afford them. Solid-surface countertops can look just as nice and cost less. It’s important that you have a basic budget in mind when you start your remodel. That may change when you talk with your Phx general contractor about the cost of the things on your wish list and then decide you want to splurge on some things and cut back on others. However, it is important that you have a starting point for the discussion. You don’t need trendy items in your kitchen like open shelving that might look good now but that won’t be very practical in terms of keeping the kitchen clean and organized. And you don’t need to sanitize your kitchen and make it please a general audience if you aren’t going to be selling right away. Instead, you should make your kitchen look as unique as your style prefers. Make your kitchen suit your tastes and needs. If you like teal cabinets, go for it! If you don’t need that breakfast nook, don’t include it. Think carefully about what your family actually needs and what you like. You’ll be spending the most time in the kitchen and should enjoy it. If you plan to sell your home right away, then maybe you talk to the contractor about the best changes to make to attract the most buyers. You really shouldn’t try to take on your kitchen remodel yourself. Many people get emboldened by the plethora of information online helping them learn how to do everything from build new cabinets to hook up a new dishwasher. But only an experienced residential contractor in Phoenix can really perform those jobs properly. When you are investing as much money as kitchen remodeling in Phoenix requires, you want to be sure that the job is done right and that it will last you for many years to come. A residential contractor will also be able to give you information about how the remodel fits in with the architecture of the house, what has to happen to meet local building codes, and what you need to think about in terms of safety. When you hire a licensed and insured contractor, you can also be sure that the job is done safely. Most contractors also provide a warranty on their work, so you have a guarantee in case anything goes wrong. Valcon General offers expert residential contractor services in Phoenix. Our contractors have performed some exquisite kitchen remodeling jobs, some of which you can see on our website. Our contractors aim to create kitchens that are as beautiful as they are practical so that they serve the home and the family. All our contractors are licensed and fully insured. Browse our website to see the type of work we do, or give us a call to get a quote for your kitchen remodeling or other home improvement project. 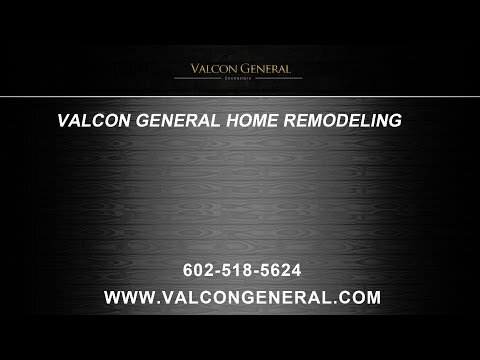 Valcon General, LLC provides home and commercial remodeling services in the Phoenix metro area including complete home remodeling, bathroom remodeling, kitchen remodeling, guest house remodeling and more.